Alexa Wilde has forged her own way in the downtown scene with the recently-opened Antlers and Astronauts, located on South Elm. The gift shop hosts a range of handmade goods and vintage clothing and doo-dads. If you’ve been to Hudson’s Hill, you’ll notice the same warmly industrial atmosphere, just with more femininity. 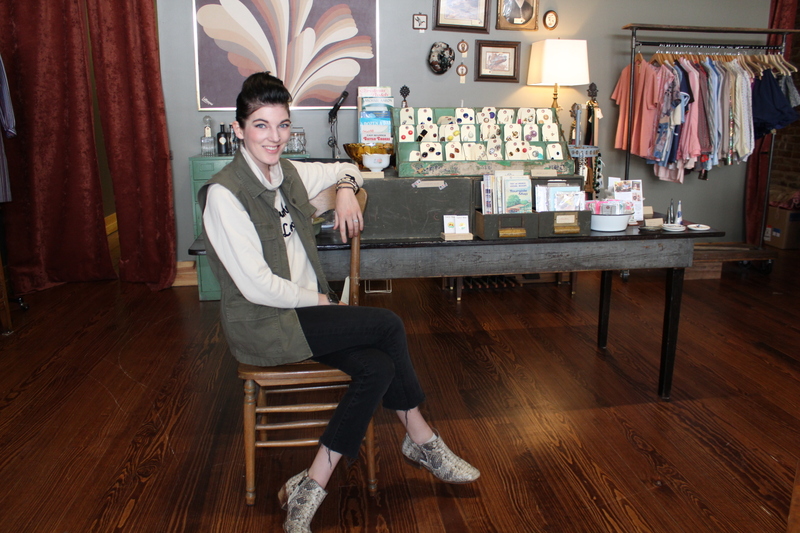 Wilde acknowledges that they play off of each other, and counts the relationships with fellow South Elm businesses as one of her success factors. It’s not surprising to learn that she was once involved in theatre, as she speaks with absolute passion about a range of topics, including what it’s like to be a small business owner and a working mom, her fascination with vintage clothing, and how exactly she came up with that catchy store name. W: Let’s talk about being a business owner downtown, and more specifically, on the southern half of Elm Street. A: I think that of the people who’ve come in, I’ve had really positive responses. People seem to give good feedback and so that’s reassuring for me. Sometimes when it’s just you, it’s hard to know if you’ve pulled it off and if people are actually responding to it. I’ve had a lot of repeat customers, which is also very positive, so at least I know that whatever it is that I’m doing, they’re responding well to. They’re coming back and they’re telling their friends and those friends are bringing their friends, so I know I’m moving in the right direction with that. My biggest challenge, still, is word-of-mouth and foot traffic. I know that most of this half of Elm Street deals with the foot-traffic struggle anyway, so I know that’s just a part of it and that it’s going to continue to get better because there is so much happening down here. Hudson’s Hill and I play off of each other quite a bit because in my mind, they’re the answer to the men’s aesthetic to what I’m doing, and I hope that they feel the same way. William was one of the people I sat down with before I made my decision and those guys have been incredibly helpful and we’re always referring customers back and forth to one another, so it is nice that we have each other to say we’re doing similar things, whereas we could be seen as competitors. I don’t get that sense with any of the retailers down here. Everyone has been super supportive. We refer customers to each other all the time and that’s part of why I think this location is so great. We all want to see each other do well and we want this end of Elm Street to do well, so we’re all contributing to that as much as we can. W: Tell me about how the idea of the store came about. A: When I graduated with a degree in communications, what I really wanted to do was work corporately for a brand that I really admired, so my dream job was to work for Anthropologie in their home office. Unfortunately, I graduated into a really terrible job market and could not find a job for the life of me, at least not the type of job that I wanted. After at least six months of job searching, my parents were finally like, “Just get a little part-time job.” I thought, “If I’m going to do this, I’m going to be strategic about it,” so I started part-time as a sales associate at Anthropologie here in Greensboro. I thought that if I could show that I learned the brand, maybe that would look better when I reapplied to their home office. Then I ended up falling in love with retail‑ I never expected that that’s what would happen. I grew very quickly in management, learned about merchandising, and started doing some merchandising and event planning with Anthropologie and later with Madewell, which are two of the best brands that I’ve ever worked for. W: What was it like to search for the perfect place to open up shop? A: This building is from the 1800s and it has three floors. It’s been completely renovated. Financially, I needed to come into a space that was already ready to go. Most of what you see in this space structurally is original to the building. We hardly had to do anything when we came in other than paint and hang some new light fixtures. It had so much raw potential that I walked in and was immediately like, this is my space. I’d always dreamt of an exposed brick wall, and I just didn’t know if I would find it or not. I love all the natural light from the windows. It’s funny because the other space I was considering was new construction. It was further up on Battleground and I was torn because I was thinking, “I’m going to have to get one of those plastic signs that just says CLOTHING or FASHION,” because it was in a strip mall and I was like, “I can’t do that because it goes against what I’m trying to create.” That was a big determining factor. I thought I might be getting more foot traffic there, but I’m all about character. I just can’t… it would’ve taken so much more to create that atmosphere in new construction than it would in just coming into a space like this. The process took three months. I started at the very beginning of the summer, searching. I had no idea how long it would take me. I had been looking at all these spaces downtown. I worked very closely with DGI and they knew what it was that I was looking for, and it seemed like every time I would find a space that I liked, it was already under contract. I had been looking at another location for a month and a half and there were a couple of red flags and I didn’t feel right about pulling the trigger and when I was finally like, I don’t know if I’m going to find another space, I should just put in an offer; they had already put an offer in ahead of me. I thought, that’s a sign. I’m supposed to pass on this building. Literally the next week, this space opened up. This is my space. I’m really thankful it played out the way it did, but I had to be patient and I had to be trusting because I don’t sit idle very well, and that whole summer I was twiddling my thumbs, waiting for something to become available. I’m glad that it played out the way that it did. W: How on earth did you come up with the name Antlers & Astronauts? A: In terms of the name and the brand, when we moved to Atlanta about five years ago, we didn’t know a soul. We moved down there because my husband started school. I was in between jobs and I had all this free time on my hands and a friend of mine suggested starting a blog to help me fill time. I thought this blog would be about our time in Atlanta and I pitched this name that I thought would be my brand name one day. I really watned to be thoughtful about it. “Antlers” represents me in the relationship: I love being outdoors; I love collecting things, finding things in nature. I’m very inspired by that color palette and those textures. My husband is the science guy. He loves science and astronomy. He’s actually a chiropractor, so I loved that the pairing of those two things was so bizarre and I loved the alliteration of it. I just thought it had a nice ring to it. The blog actually never panned out but I kept the brand name. W: How did your love of vintage fashion influence what you carry in the store? A: I grew up in the theatre and I think that’s where my love of vintage clothing came from. I wore a lot of vintage in high school and college. With the vintage clothing that I source, I really try to emphasize “wear now” and the ability to incorporate it into your modern wardrobe. I think vintage clothing can feel very alienating because unless you’re really committed to it, it doesn’t always work with what you have in your closet. Even if people think they don’t care for vintage clothing, I try to find pieces that they might fall in love with. I think I had known for a long time that I wanted to do something with vintage clothing, but I realized as I got older and as I worked in retail a little bit longer, that vintage clothing alone was not going to be enough to sustain a business. It’s a niche market and it’s not sustainable. Map of handmade good origins. W: How do you choose the handmade goods that you carry? A: I’ve seen amongst my peers this gravitation towards wanting to shop local, wanting to support local, and this kind of entrepreneurial spirit of my peers, people who are creating and making. It could be stationary or candles or macramé, whatever the case may be. During my time in retail, especially working for such creative brands like Anthropologie, you just meet people along the way- either on the side or as they go on to pursue these crafts full time. That’s initially how it started, was me following my friends and my peers who were crafting on the side. Once I moved to Atlanta, that’s where I really got tapped into the homemade market. I did a lot of pop-up shows there. I started out as a vendor and eventually as a consumer. For Madewell, I was organizing events for the entire Southeast, their pop-up shops. It was my job to always be on the lookout for bloggers or handmade goods, people that were local. That’s how it started and I used Instagram as a networking tool to mentally keep track of all these people whose goods I really liked. When it came time to open the store, I sat down and made a list and said these are the handful of artists that I have to open the store with, and then it’s just grown from there. I wanted to make sure I had a good variety of the types of things that I had for sale. There are still some things I’d really like to expand into, like I don’t have any beauty products or kids products, and those are two things I still really want to bring in. Ultimately, especially with the handmade goods, what I’m aiming to become is a destination for gifting. People who think they have no affinity towards vintage or antiques, that’s okay, I still want to be the place they think of to come for a housewarming or birthday gift. W: It takes a magnitude of strength to be a small business owner. Where do you find your motivation? A: First and foremost, my mother is a small business owner. The nature of her business is very different from mine; she manufactures products for childcare centers, like bibs and rest mats and sheets and blankets. I admire my mom a lot. She’s a very strong, independent woman. Ironically, my dad is now working for her. He’s retired and has joined the business with her. I grew up seeing her grow and develop this business. She left her full-time job with Wells Fargo after many years and took off with this small business, which her dad actually started and she’s really grown over the last 10-15 years. It’s been really cool to watch, and I think because I’ve never really taken the easy way out in certain things, I’m pretty independent myself. Having worked for these corporations, these larger brands like Anthropologie and Madewell, there were always things that I thought they did very well and there were certain things where I’d think to myself, if I was a small business owner, I wouldn’t have to do this or I would do this very differently, and would kind of just log those things away in my mind to be able to say, “When that time comes for me, then I know what not to do, or this is what I should model myself after.” I like the flexibility of it; not so much in schedule, although that is nice now that I have a young family; but the flexibility in that I get to choose what music I play; I get to choose what products I put in the store or how it looks. There’s something very freeing about that. It’s super fun for me. I love walking in these doors every morning. I think at the point which I don’t love it, then it would be time to consider something different. I would imagine that I would continue to love what I do for many years. There are just so many things that I envision for this brand and I don’t think I’ll get bored of it any time soon. My family and my friends have always picked at me because I love trying lots of different things. There are a handful of things in my life that I’m very passionate about and even within those, I want to do it all, I want to try it all. I think this is one of the only things I could see myself staying with for years and years. I think the reason why it’s taken me this long to get to this point is that I needed to gain experience from all these different brands, all these different roles, to feel like I was prepared for this moment, and I truly do. I think if I had done it even six months prior, I would not have been ready. I just felt like the time was right. People say all the time, “It must have been so scary. Was it nerve wrecking?” Obviously, the day-to-day is nerve wrecking, because it’s like, I hope I make my rent this month, but generally speaking, starting the business wasn’t scary for me because I felt like this was it. Everything had led up to this point and I felt totally prepared. My mom has been an incredible resource when it comes to the logistics of running a small business, even though her business is very different. W: Speaking of your new family, how do you balance being a mom with owning your own business? A: You would think that it would be so easy because you get to make your own schedule. The problem is, I’m the only one here. I’m the only one running the store. I’m the only one shopping for the inventory, and I also have to be a mom and a wife. It is challenging right now. I foresee being able to hire somebody to help take the load off a little bit, which would free me up to do things like shopping for inventory, which I’m now having to do in the mornings before I come in, or online. I know I’m missing out on some business by being closed Sunday and Monday, but Sunday is a work-life balance thing for me, and always has been as long as I’ve worked in retail. I’ve kind of always resented working on Sundays, because for me, that’s my family day and that’s the day I prepare for the week, so when I don’t have that day, it’s very challenging. Monday is the day I use to run errands and shop for inventory. I’m open Tuesday through Saturday, but not until noon, so that allows me time to run to thrift store or the craft store or the hardware store to get things to prepare for the day. In many ways, it has freed me up a lot to be more present with my family. I get my mornings with my son, which is really nice and I get to drop him off at daycare. I think back to when I lived in Atlanta and not only was I working nine hours day, but I had an hour commute each day. In that regard, I’m so grateful I have more of that balance now.